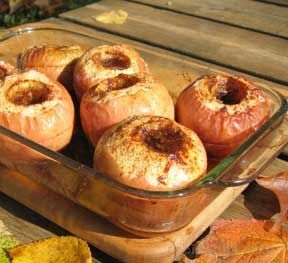 Always enjoyed in the fall, but delicious anytime of the year, baked apples provide a warm and delightfully sweet treat as a dessert or snack. Wash outside of apples. Remove stem and core apple to within 1/4 inch from bottom. Lightly score through the skin, around outside middle of apple. Score the apples so the knife only breaks through the skin to help prevent the apple from splitting as it bakes. 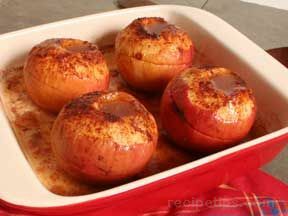 Place apples in baking dish. Mix water and lemon juice together, filling each apple with approximately 1 tablespoon of this mixture. Remaining mixture can be poured into baking dish. 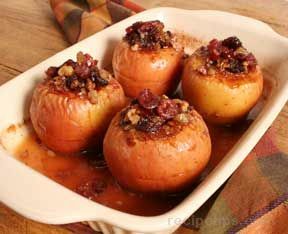 Divide raisins into 4 even bunches and fill apples with raisins. Combine sugar, cinnamon and nutmeg, mixing together thoroughly. Sprinkle into apples. If there is excess, sprinkle randomly around baking dish liquid. "We made this recipe this weekend and everybody loved it. I served it with a scoop of ice cream and also added some brown sugar to recipe. Once I got the hang of coring the apples, it was extremely easy to get everything together for this and will be one that we'll have again often in the future!"